President Maithripala Sirisena is firmly ensconced in his seat as President. It is will not be easy to tip him out, whatever his opponents think. But the media is not always admiring towards President Sirisena. Colombo Telegraph under the headline Entire Sirisena Family At The UN” said, Colombo Telegraph reliably learns that President Maithripala Sirisena, who is currently in New York for the 72nd Regular Session of the UN General Assembly has been accompanied by his wife Jayanthi, son Daham and daughters Chathurika and Dharani . Two years ago Daham Sirisena was spotted attending the UNGA sessions and seated with the Sri Lanka delegation, raising eyebrows and causing much embarrassment to the President”. Sunday Times, 24.9.17 pointed out that Sri Lanka is usually given the opportunity of making its speech on the opening day, but that that the Hall usually empties after the main speech. 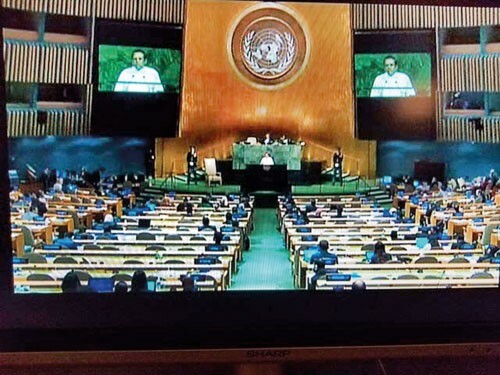 Sunday Times showed a photograph of the Hall, with most seats empty, and said Pictured here is President Maithripala Sirisena addressing UNGA this week. He spoke in Sinhala. President Sirisena recently had a book written about him. The writer was his daughter. Ryp van Winkle commented. My dear Chathurika, I thought of writing to you when I heard that you had written a book about your father. Already, some people doubt whether you really wrote that book because you were not known for your literary talents until now.” Ryp van Winkle continued, In the book, you paint a picture of your father as a very principled man. If so, can you ask Janaadhipathi thaaththa why he allowed corrupt people who lost at the election to sneak back in to Parliament through the National List and made some of them ministers? Ryp van Winkle had a few more questions. Can you also ask Janaadhipathi thaaththa why he insists on controlling the Blue party when the majority of Blue party MPs don’t want him as their boss and have formed a separate group? Your father promised us an efficient government with a Cabinet of thirty ministers. If so, can you ask Janaadhipathi thaaththa why we now have almost a hundred ministers of one type or another who go about contradicting and attacking each other in public, while no work gets done? .Also can you ask Janaadhipathi thaaththa why the GMOA is always on strike and all medical schools are at a standstill over a private medical school issue which has not been settled for so long? Your father claimed that Mahinda maama was a dictator and promised to be democratic in everything that he did. If so, can you ask Janaadhipathi thaaththa why local government and provincial council elections have been postponed? President Maithripala Sirisena is not a ‘hands on’ President and does not even pretend to be so. Television news on 14.9.17 showed a discussion between the RDA officers, cabinet ministers and President over the tender for the Central expressway. President Sirisena seemed to know nothing about the tender and wanted to know what the media was complaining about. RDA explained that it was over tenders that were made for the third stage of the Central expressway, they were having difficulties with it. President Sirisena seemed to have no idea about how the work was progressing either. He complained that when he went to Kandy recently, he couldn’t see any work being done on the expressway. The Rajapaksas, on the other hand are, it appears, still in the picture, in the literal sense too. At the reception hosted by the Embassy of China to celebrate the 68th anniversary of the founding of the Republic of China, the chief guest was Minister Rajitha Senaratne. Mahinda Rajapakse was also there and television news showed the warm welcome he received. In the photo spread of the event in Sunday Island 1.10.17 the centre photo was of Mahinda Rajapaksa with the ambassador. There is as second photo of Rajapaksa shaking hands with John Amaratunge while Sarath Amunugama looks on. This gives the impression to the casual reader that the chief guest was Mahinda Rajapaksa! Rajapaksa led a delegation on a tour of Japan in June 2017. The delegation was also invited to participate in a function at the Muryoko-in Buddhist Temple in Koya, Wakayama by the Japan-Sri Lanka Buddhist Organization for International Cooperation. The Sri Lankans living in Japan had met Rajapaksa. Sri Lankan businessmen in Japan, including vehicle importers, had complained to Rajapaksa that they were no longer in a position to survive due to disastrous government policies. They are asking us, the Joint Opposition, to take up this issue with the government as other sections of the Opposition have been rendered ineffective through bribes, said Rajapaksa, on his return. They were frustrated with the conduct of Yahapalana government and they are asking for a regime change in Sri Lanka. Dayan Jayatilleke wants to see Mahinda Rajapaksa as Prime Minister and Gotabhaya as President. Sinharaja Tammita Delgoda says the silent figure in the equation is Gotabhaya Rajapaksa. Gotabhaya’s Facebook site, titled ‘New Hopes rising’, looks to the future and hints at a new dawn. A powerful political force, in the public mind, Gotabhaya Rajapaksa represents achievement and doing, a man ‘who will do what he says going to do.’ Towards the end of 2014 the Rajapaksas were the past. Now they could be the future, concludes Delgoda. Cracks are appearing in Yahapalana rule, but they are unlikely to shake Yahapalana or its handlers. ‘SLFP rebels’ took control of SLFP Lawyers Association in the Ratnapura District in March 2017. The Association comprises lawyers representing Ratnapura, Pelmadulla, Balangoda and Embilipitiya courts. In September 2017, there were two sets of resignations from the SLFP. Three councilors of the Eastern Provincial Council representing Ampara district resigned from SLFP and joined the Sri Lanka Podujana Peramuna. They appeared on television news and made a brief propaganda speech for Podujana as well. Thirteen UPFA members of the North Central Provincial Council also resigned from the SLFP and joined Podujana. Chairman of the Colombo Commercial Fertilizer Company, Thusitha Halloluwa tendered his resignation, stating that he can no longer work under Agriculture Minister Duminda Dissanayake, due to political interference. Halloluwa complained that he was ordered to pay a monstrous breakfast bill amounting to Rs. 1.5 million, hosted by an institution coming under the Agriculture Ministry. I rejected the request as it was against the financial regulations to spend public funds in that manner. Public funds must be spent responsibly”. Colombo Commercial Fertilizer Company is under the Ministry of Agriculture. Colonel Sunil D. Peiris, Director of Human Resources at SriLankan Airlines, and member of its Board of Directors, resigned from his position in July 2017, after a recent meeting summoned by President Maithripala Sirisena, regarding the order for A350s placed by the former regime. The airline’s directors faced a barrage of accusations from ministers, mainly Dr. Rajitha Senaratne and General Sarath Fonseka, who incidentally was a relatively junior officer in the army during the tenure of Col. Peiris who headed the first Commando Regiment. We went to the meeting armed with facts. But before any member of the Board could explain matters, we faced a tirade of accusations from Ministers Senaratne and Fonseka, with the former accusing us of many things. Many of the accusations I must assert were diabolical lies, dished out by some ministers. We were humiliated. None of the directors including Chairman Ajith Dias were given an opportunity to explain their position. It was a one-sided meeting, he said. People are waiting for a change. The Joint Opposition has been able to mobilize the masses without any political party at all. What counts now are not labels or name boards but masses of people, observed Chandraprema. In September 2017,the opposition started a new organization called ‘Eliya’. Its leader is Gotabhaya Rajapaksa. ‘Eliya’ is a mass organization unlike Viyath Maga which is restricted to professionals . ‘Eliya” was ceremonially launched at the Golden Rose hall in Boralesgamuwa. The large hall at the Golden Rose which is bigger than the main ballrooms of most top end city hotels was packed by 5.00 pm with standing room only before the event began. The turnout was all the more surprising because this event was held on a working day and 5.00 pm was the peak of the evening rush hour. ‘Eliya’ launch was in the form of a seminar on the proposed new constitution. The panel of speakers included Gotabhaya Rajapaksa who introduced the new organization to the audience. Ven. Prof. Medagoda Abhayatissa , Dr Dayan Jayatilleke, Rear Admiral Sarath Weerasekera, Dr Seetha Arambepola, Rev. Fr. Wimal Tirimanne, Tamara Kunanayagam, Lawyer Rushdi Habib and Maj. Gen. Kamal Gunaratne were among the speakers at this event. Photos showed a large gathering of bhikkus. The respected Catholic priest, Rev. Fr. Tirimanne spoke at length. It was clear that the majority of the votes received by President Maithripala Sirisena were from the minority communities in the North and East and elsewhere, Rev Tirimanne said. Incumbent Prime Minister, D.M.Jayaratne, had a clear cut majority in parliament, but Ranil Wickremesinghe was appointed Prime Minister though he only represented 46 MPs in a Parliament of 225. Such a thing has not been heard of anywhere in the world. Furthermore, defeated candidates were brought into parliament through the back door. Rev. Fr. Tirimanne also observed that local government and Provincial Council elections are being indefinitely postponed with flimsy, ridiculous excuses and the President repeatedly says that this government will continue till 2020 no matter what – implying thus that they would remain in power whether they have a majority in parliament or not .These are the people who are going to draft a new constitution for Sri Lanka, he observed. Rev. Fr. Tirimanne also stated that there were issues about the legitimacy of the mandate for a new constitution and the credibility of the agents who want to draft a new constitution for this country. He pointed out that in 1972 and 1978, the constitution was changed by governments that had a huge mandate but that in contrast, the present government had been elected with a slim majority and in his opinion this did not constitute a mandate to carry out such drastic change in our country. Yahapalana has not held elections for Local Government and Provincial Council elections since it came to power in 2015 nearly three years ago. The elected institutions of government are going into abeyance stage by stage from the bottom up, observed critics. Today not a single local government institution is functioning countrywide. This is no accident. Yahapalana wishes to see the local government bodies become inactive. Also, when Provincial Councils are dissolved, provincial politicians become nobodies overnight, leaving only an elected Parliament under the control of Yahapalana . The local government institutions were dissolved in two stages. The Pradeshiya sabhas went first, Municipal Councils followed some months later. he period of office of all these bodies expired by the end of 2016. 335 local government bodies, consisting of 22 municipal councils, 41 UCs, and 271 Pradeshiya sabhas, are now without public representatives for two years. They are under a Special Commissioner. Commissioners are now running the country’s Municipal Councils, Urban Councils and Pradeshiya Sabhas, said critics. Bodies that should be run by persons elected by the people’s vote are now run by officials and political nominees. Yahapalana keeps postponing local government elections. Before they can be held, the Municipal Councils ( Amendment) Bill, Urban councils (Amendment) Bill and the Pradeshiya sabha (Amendment) Bill will have be passed in Parliament. Then it was the turn of the Provincial Councils They also will be dissolved one by one, predicted critics and come under Governors’ rule. Sabaragamuwa, North Central and Eastern Provincial Councils ended their terms in September 2017. Having postponed the local government elections for more than two years. Yahapalana is now exploring ways and means of postponing Sabaragamuwa, Eastern and North Central Provincial Councils polls, observed critics in August 2017. In the process, they are doing things that nobody has ever done before, said Chandraprema. Here is what Yahapalana did. Yahapalana resurrected the Provincial Council Elections (Amendment) Bill which had been presented in Parliament months earlier. This was a Bill to make certain minor technical corrections to the local government elections law. The government took this bill up for debate in Parliament in August, 2017 and at the committee discussion stage introduced over 50 new amendments which completely changed the objectives of the Bill and also the mode of elections instead of introducing a new electoral system in place of the proportional representation system, these amendments re-introduced the proportional representation system through the back door without any public discussion at all. The original gazette ran to 15 pages and the amendments ran to another 15 pages. The two main sections in the brief one page Bill were deleted, and replaced with 22 new sections in a now 21-page Act. These sections had no relation whatsoever to the original Bill. All the Schedules to the principal enactment were repealed. There was a new section to establish a Delimitation Committee. The percentage of female candidates contesting a Provincial Council poll was altered from 30% to 50%. The Bill presented for a Third reading was a completely new Bill which had no relation whatsoever to the original Bill that had been published in the Gazette and placed on the Order Paper. Joint Opposition complained that the amendments had been given to the Joint Opposition only on the morning of the debate and they had no time to study the amendments. Dinesh Gunawardena observed that the contents of the Bill did not relate to the title. ‘These were entirely new laws. The Government should have first gazetted such new laws giving the public an opportunity to study the provisions and challenge it, if necessary, before the Supreme Court’. Further, the English version differed from the Sinhala text. Speaker Karu Jayasuriya came in for criticism over his handling of this matter. Dinesh Gunawardena said that Speaker Jayasuriya had allowed his party to operate with impunity at the expense of parliamentary traditions and Standing Orders, The Speaker had paved the way for the UNP, a section of the SLFP (those loyal to President Sirisena), TNA and JVP to bring in the controversial amendments to the Provincial Council Elections (Amendment) Act at the eleventh hour. Further that he had displayed his partiality towards the UNP led project by giving two hours and forty minutes for the government to secure the required two-thirds majority.. Gunawardena argued that Speaker Karu Jayasuriya should not have allowed this Bill to become law. Jayasuriya was clearly supportive of the Yahapalana regime change. He was associated with the earlier attempted regime change of the 2010 too. The government has now hit on a device that can prevent proper discussion and even judicial review of a Bill, by withholding the most important parts from the original Bill, keeping it back till the committee stage in parliament, commented Chandraprema .Yahapalana has now taught Sri Lanka how to gazette one Bill and pass a completely different one, by introducing new amendments at the Committee stage in Parliament. This action by Yahapalana has created a furore. Many organizations have protested over the issue. Can a government gazette a Bill and then proceed to introduce several amendments at the committee stage which, in effect, constitutes a completely different Bill, and thereby deny the citizen the opportunity to invoke the jurisdiction of the Supreme Court in respect of that substantially new Bill, asked critics. Joint Opposition was consulting its lawyers prior to going before Supreme Court. MP Udaya Gammanpila has asked for a directive from Supreme Court to the National Elections Commission ordering them to hold the three Provincial Council elections. In an unprecedented move, one time Chief Justice Sarath Nanda Silva filed a fundamental rights petition in the Supreme Court challenging the Bill. Attorney at law Aruna Laksiri Unawatuna filed an application for interventions, requesting court to dismiss the application by Sarath Silva, saying that an Act of Parliament could not be challenged in a court of law. TNA parliamentarian M Sumanthiran and lawyer Rajika Kodituwakku also filed similar petitions. The Bar Association of Sri Lanka (BASL) said that there was a clear set of procedures to be followed when Bills were passed. The Yahapalana government had had adopted methods in contravention of the due process. This would have an adverse impact on the rule of law as well. President, BASL said his Association intended to discuss the issue with President and Prime Minister and hoped to provide legal advice on the matter. The People’s Action for Free and Fair Elections (PAFFREL) have complained to the Supreme Court that the Twentieth Amendment to the Constitution, violates people’s sovereignty and franchise and it needs to be passed with a two-thirds majority in Parliament and approved by people at a referendum. The proposed amendment also seeks to enable Parliament to postpone Provincial Council elections until October 18, 2019 and exercise powers of the dissolved councils until such time. This is in violation of Article 75 of the Constitution. The government has been saying that they will be holding the postponed Local Government elections in January 2018 and the postponed PC elections in March 2018. But one can be sure that they will not hold any elections between now and the next Presidential or parliamentary election, said Chandraprema. There are enough complications in the amendments to the LG elections law and the recent PC elections law to ensure that no elections are held in the foreseeable future. The new Act includes a Delimitation Committee, to carve out electorates within a province. Like in the case of the demarcation of boundaries for local bodies, this can go on forever. Judging by the lengths Yahapalana want to in Parliament to avoid holding elections to three Provincial Council, one can be certain that despite anything this government may say, they will not under any circumstances hold the local government elections, which have to be held countrywide, declared Chandraprema. Such elections would show the loss of the government’s legitimacy countrywide instead of in just two or three provinces. They do not want to face the Provincial Council polls either as they fear they will lose those as well. So we are now faced with a situation where no elections will be held in the foreseeable future. The government is scared of facing an election knowing that it will end in ‘certain defeat’ for Yahapalana . We have seen angry demonstrators say on camera in television news, Wait until the next election comes.”An election defeat would have had fatal consequences on Yahapalana’s already tenuous hold on power. Yahapalana thinks that by somehow dodging elections in this manner it will be able to hang on at least until the term they were elected for runs out. This is a government that is engaged in a headlong quest for political survival. Chandraprema observed that when the recent elections to Cooperative Societies were held the government lost by huge margins. Given the fact that the Cooperative Societies have something like eight million members, the message that the government got was that they were looking at a resounding defeat at the next election. The Joint Opposition group won elections in three divisional areas , Amatiyagoda, Warayara and Welkiniyaya of the Godakawela Cooperative Society in the Ratnapura District in August 2017, UNP did not get a single seat. UNP members assaulted officials and Opposition members to disrupt elections in 20 other areas they did so in the presence of the police. The UNP-led disruption started at the Ambawila divisional area election held at the Ambawila Rajamaha Viharaya. Chief Incumbent of the temple Ven. Hatnagala Dhammarathana Thera asked cooperative officials not to hold the election to prevent further violence. Similar incidents were reported from several other areas. It was reported that there had been a heavy presence of outsiders at the polling centre in Pallebedda. Accordingly, Provincial Cooperative Commissioner decided to postpone the polls in the other 20 divisional areas until further notice. Yahapalana celebrated the 70th anniversary of parliamentary democracy in Sri Lanka in October 2017. There was very poor attendance at the special sitting. MPs of both sides, including front row members were missing. At least 70 MPs did not attend. MPs who attended used the opportunity to hit Yahapalana . JVPs Anura Kumara Dissanayake said that democracy was strangled in Parliament. . Parliamentary democracy was at very low ebb, said Aluthgamage , “The Joint Opposition has no opportunity to speak in Parliament . The rest of the Opposition is silent on all issues the country is facing right now.”They only took up issues which affected the people of the North. Yahapalana started by enjoying the support of the Maha Sangha, notably the support of Maduluwawe Sobitha. A second group led by Ven.Murutthuwe Ananda were with the Opposition. A third group Bodu Bala Sena and Ravana Balaya were manipulated to ensure political victory and also bring Buddhism and the Maha Sangha into disrepute. But never before has any government angered the Maha Sangha. The Maha Sangha are now angry with Yahapalana and are very vocal about it, too. A group of bhikkus called a media conference, and this was shown on television news on 14.9.17. At this conference, Ven.Murutthuwe Ananda of the Mawbima Surakeema Jathika Balaveaya protested strongly about the insulting attitude of Yahapalana to the sangha. Never before has there been a government that has insulted the sangha like Yahapalana does, he said. Ven. Gonbaddala Samitha of Pavidi Handa protested that the sangha has been referred to as ‘thamusey’. The public should avoid using offensive terms for sangha. Ven. Omare Kassapa said that the president should tell these people to shut up and not insult the sangha. The speakers also included Ven. Iththakande Sadhatissa of Ravana Balaya, Ven. Kamburugamage Vajira, Ven Walgama Chandraratana of Sri Lanka Maha Sangha Sabhawa and Ven. Kakunawimala Vanarathana of Vidylankara Pirivena, Pannipiya. The bhikkus specifically named Sarath Fonseka, Rajitha Senaratne and Ranjan Ramanayake as those who had insulted the sangha. There was reference to the sil redi issue as well. Yahapalana retaliated with their own madhya hamuwa where they said that the bhikkus were getting unnecessarily worked up. However, the SLFP spokesman said that MPs should keep their mouths shut about the sangha. The sangha are also turning militant. Regional Development Minister Field Marshal Sarath Fonseka had said that Ven. Elle Gunawansa ,Chief incumbent of Dharmayathanaya, Colombo was a mad man in robes. Elle Gunawansa said that this remark had compelled him to decide to join the camp of patriotic forces and get on the political stage for the sake of the country. The Maha sangha are also now getting very worried about the political direction taken by Yahapalana . A group of Buddhist monks, together with a large number of laypersons, performed an adistana pooja in front of Sri Dalada Maligawa in December 2016, pledging to oppose the proposed Constitution which, they said, according to their information, would include provisions inimical to the country’s interests. This group said they would urge parliamentarians not to back the new constitution. They said the government had to desist from facilitating a federal setup through the proposed Constitution and depriving Buddhism of the foremost place given in the existing Constitution. The monks said Provincial Councils must not be given land and police powers. Prior to the adistana pooja the Bhikkus led by most Venerable Medagoda Abhayatissa Nayaka Thera of Pepiliyane Sunethradevi Pirivena called on the Most Venerable Dimbulkumbure Sri Wimaladhamma Anunayake Thera of Malwatte, and requested that the heads of the government be urged to refrain from introducing constitutional provisions detrimental to the country. Several Bhikku organizations had prepared a memorandum demanding that 12 provisions in the existing Constitution be retained in any future constitution. The memorandum had been signed by 104 leading Buddhist monks. Venerable Bengamuwe Nalaka said that the Maha Sangha would launch a house-to-house campaign to educate the people on the need to oppose the new constitution. Venerable Nalaka said any decision in Parliament on constitution could not be taken seriously as some MPS and ministers had been rejected by the people at the last general election. Venerable Ittekande Gnanissara said that every attempt would be made to defeat the new constitution to be jointly tabled by President Maithripala Sirisena, Prime Minister Ranil Wickremasinghe and TNA R. Leader Sampanthan. The deputation included Venerable Induragane Dhammaratana , Ven. Bellanwila Dhammaratana, Dr. Gunadasa Amarasekara, Sudath Gunasekara, Sarath Weerasekara and Manohara de Silva. Northern PC officially ends the 5-yr term in Sept 2018 (started in Sept 2013). Tamil Leaders plus others who may find the Separate state type arrangement useful, are now trying to get it through the dubious New Constitution before the 5-yr PC term ends in Sept 2018 ? Remove the ILLEGAL 13-A and unify the Country. No need for a New Constitution. Once the new con-stitution is passed there is NO WAY to reverse it. Even the people OPPOSE it now will love it. Remember 13 amendment? Northern PC officially ends the 5-yr term in Sept 2018- than new election( with in a year) We will select new PM sorry CM for NPC (Saiva TE) so on ….. nothing to do with new constitution because two different country so two different system ….